Can you eat Gar?? Absolutely! Here are some simple cleaning instructions. I decided to create a Gar Cleaning page because I believe others have the same mindset that I used to have when it comes to eating gar. I used to wonder if gar were good to eat. Generally you will hear most people say they are not a good fish to eat. But I will bet you a dollar that most of these people have never actually eaten a gar. I took my first alligator gar about four years ago. The captain of the boat asked if I planned on eating the gar. I asked him "Why? Are they good?". He informed that it is one of the highest priced fish on the menu in many Louisiana restaurants. I proceeded to have the gar cleaned. The next day after I got home I analyzed the meat only to find that this was some very tasty looking meat. I had two long thick slabs of pure boneless meat. I cut the slabs into 'steaks'. Deep fried the steaks in my fish fryer and then proceeded to eat until I could eat no more. The alligator gar was absolutely delicious!! That aroused my curiosity about the common gar that we shoot. I'm talking about long nosed gar, short nosed gar and spotted gar. Well on my next trip I kept a couple of the gar just to give it a try. Once again, the meat was delicious. In my opinion gar does not have a fishy taste. If it taste like fish then I will not eat it. The texture of the meat reminds me of the texture in chicken. No, it doesn't taste like chicken but the texture is very much the same. Gar meat is not flaky like your average fish. 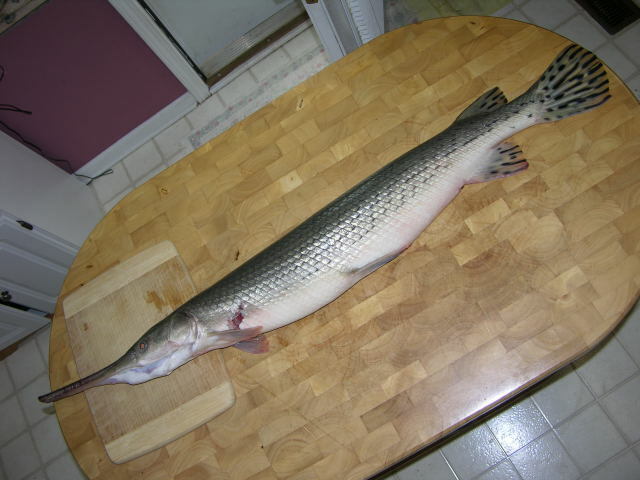 Alright, here is all you have to do to clean a gar. It's very simple. 1. Have the proper tools ready. All you need are tin snips and a filet knife and maybe a hatchet or a wire cutter. 2. Get a hole started just behind the top of the head. This can be done in several ways. You can use the hatchet or you can even use a pair of wire cutters to 'pinch' the skin on top and cut through it. 3. Now get your tin snips and cut down each side of this hole. You do not have to cut all the way around the fish. Just cut down to the cutting board. 4. 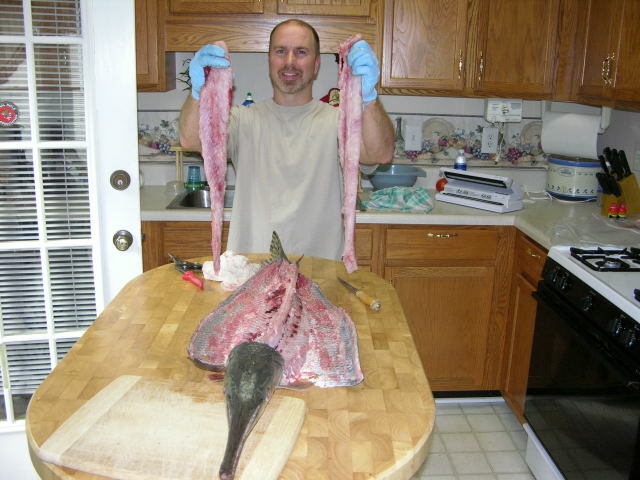 Then simply use your tin snips and begin cutting the skin down the middle of the back until you get near the tail. 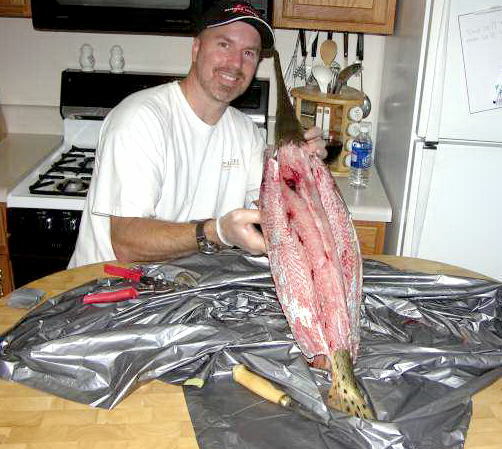 Once again cut down the side of the fish near the tail. 5. Begin using your fingers and peel the hide away from the meat. Use your filet knife where necessary. 6. Now that you have the skin peeled back and the meat showing,simply slice down along the back bone and across the top of the ribs, much like you do when you are removing back straps from a deer. 7. Remove your two filets. Thats it! Now heat up the fish fryer and get ready for a mouth watering meal! Another great gar recipe is to slice your gar meat up into nuggets. Purchase some Louisiana crab boil from your local grocery store. Boil some water with the crab boil spices. 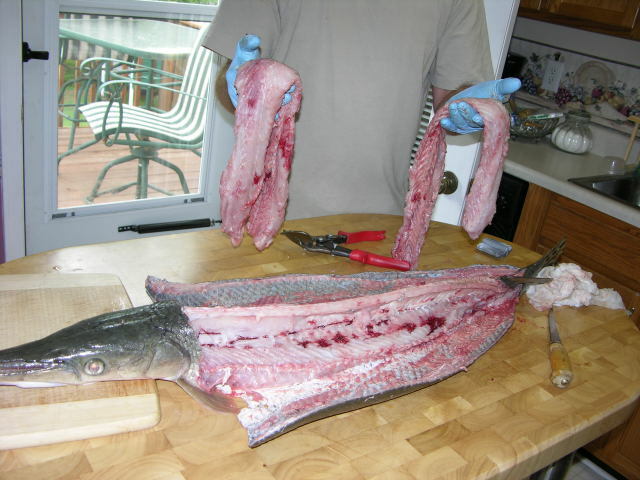 Once the water has came to a rolling boil put in your gar meat. Let it boil for just a few minutes (depends on the amount) and then turn off the stove and let the gar meat soak in the crab boil for about 5 minutes. Melt a stick of butter. Take your gar nuggets and dip them in the butter. This will actually have a lobster taste to it. Delicious!! !